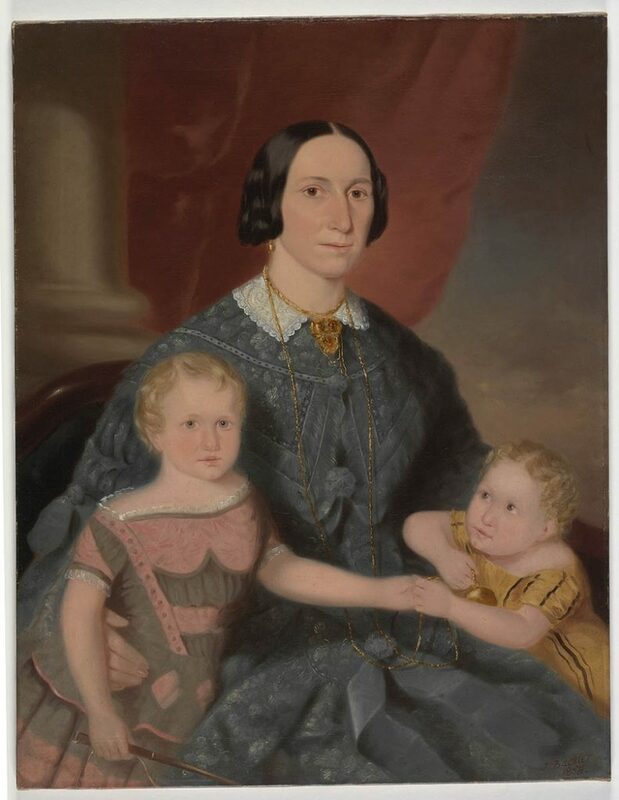 This charming family portrait shows Margaret Moore Smail, aged about 32, with two of her five children: John standing to her right, aged about 7, and Isabella Rhubina, aged about 4, on her left. Emancipist artist Joseph Backler was a prolific and highly-regarded portrait painter, with his client base drawn from those who had also done well in the colonies: publicans, builders, millers, ship-owners, shop-owners, and farmers. The most distinctive feature of Backler’s work was his careful delineation of the faces of his subjects which did not tend to flattery. Mrs Smail and her children are conventionally posed in a domestic setting furnished with a [cedar] sofa, probably of colonial manufacture upholstered in black [horsehair], an architectural column with red curtain drapery and a landscape vista behind. Mrs Smail wears a one-piece home dress in a soft, light-weight gauzy, floral-patterned grey fabric, made closed to the throat with a pointed white work collar, fastened by a large triple-lobed chased gold brooch, above the bodice with its sloping shoulderline and wide, double-layered capelet trimmed with braid and fringing, applied over the bust pointed waistline, full spreading skirts and pleated, split ‘pagoda’ sleeves, the whole ensemble trimmed with rosettes, bows and streamers of grey [silk] ribbon. She wears her centre-parted dark hair in a moderate version of the ‘bandeau’ style, wrapped over her ears above pendant gold earrings, and tucked into a low bun at the nape of her neck, around which is draped a long, gold watch chain hanging well below her waist, and suspending a heavy gold watch with which the two children are playing. John wears typical attire for boys during their toilet training years and before they were breeched (ie. put into breeches or trousers) at around 5-6 years of age. His full-skirted, short-sleeved dress is constructed in a jaunty combination of grey and pink fabrics with military style trims and a wide shallow neckline above a fitted, pleated bodice with a narrow peplum at the waist, his white undergarment just visible at the neck and edges of his sleeves. He holds a toy whip in his right hand, a suitably masculine attribute, and his short blonde curly hair has been brushed into a side parting – a useful indicator of gender in an era when all girls wore their hair with a centre parting. Isabella wears a toddler’s dress of yellow fabric with bands of black ribbon marking its v-shaped plastron bodice above a loose skirt and short, shirred sleeves; her curly blonde hair is arranged with a gender-appropriate centre parting. Irish-born Margaret Moore (1826-1870) was the daughter of a farmer. She arrived in NSW from Enniskillen, County Fermanagh, in 1844. Alexander Smail (1816-1867) was born in Scotland and migrated to Australia on the Herald in 1844 with his first wife Violet, nee McCleod (1821-1847), and two of their ten children, Robert (1840-1871) and Violet Jnr (1843-1844) who died shortly after the family’s arrival in February. Another son, Alexander Jnr, was born in Sydney (1844-1906), before the death of Mrs Smail on 27 June 1847. Later that year Alexander Snr married Margaret Moore. The couple had at least three sons and two daughters including John (1850-1920), Isabella Rhubina (1853-1945) and Fanny Jane (1857-1920). Alexander Smail set up a bakery in Bathurst Street in 1844, moving the business to Argyle Street at Miller’s Point in 1851, where he remained until his death in 1867. He was elected Alderman for Gipps Ward from 1 December 1864 to 4 September 1867, and died on 8 October 1867. At the time of her death in 1870, Margaret Smail owned a store and bakehouse and two allotments on the north side of Argyle Street, a parcel of land on the south side of Argyle Street, Millers Point, and 10 acres at Clarence Town, near Maitland. John Moore Smail was chief engineer for the Water Board, in charge for 20 years of both Sydney’s water supply and its sewerage system. Educated at Fort Street and Sydney Grammar, through the influence of his father, a City of Sydney alderman (1864-1867), John was apprenticed to the City Engineer whose department controlled Sydney’s water supply. In 1879 he was appointed the first engineer of the newly created Sewerage Board; he also later became engineer-in-chief for the Water Board. John Smail was the first president of the Institute of Local Government Engineers of Australasia and its first Life Member, a member of the Association of Municipal and County Engineers of Great Britain, and a member of the Royal Society of Australia. He conducted routine biological testing of the Sydney sewerage network and inspected similar systems in Europe and America. An officer in the army reserve and a magistrate, at the time of his death on 17 June 1920, he was engineer-in-chief to the Metropolitan Board of Water Supply and Sewerage. Isabella Rhubina Smail married William Davidson in 1883, and died at Drummoyne in 1945. Joseph Backler (1813?-1895) arrived in Sydney in the Portland on 25 May 1832. Convicted in 1831 for issuing forged cheques, the 18-year-old was sentenced to death, later commuted to transportation for life. Indents describe him as being able to read and write and list his profession as a landscape painter. Continually in trouble, Backler was not granted a ticket-of-leave until February 1842. From 1843 he was assigned to Sydney frame makers and carvers, Messrs Cetta & Hughes, and in that year also advertised his services as a ‘Portrait, Miniature and Landscape Painter, in oils and watercolours’. He was finally granted a conditional pardon in 1847. Probably the most prolific oil painter in early colonial Australia, Backler made his name as a portrait painter and more than 120 of his works survive.